The colours of the Vacumatic Parker 51's and the Aerometric Parker 51's. he Parker "51" is the worlds most sold fountain pen. 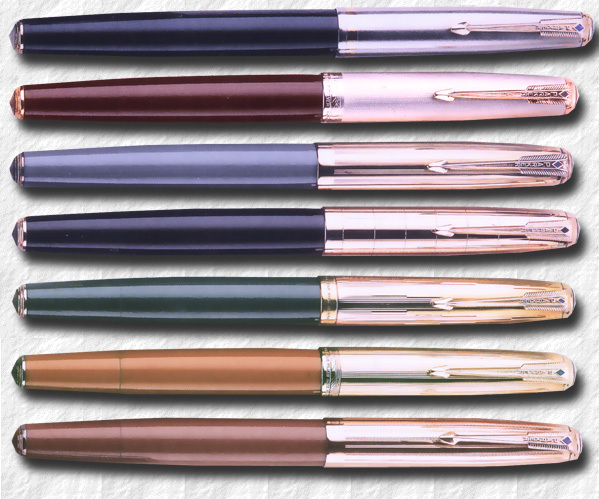 The Parker "51" took eleven years to develope but Parker sold over 20 million pens during more than 30 years! 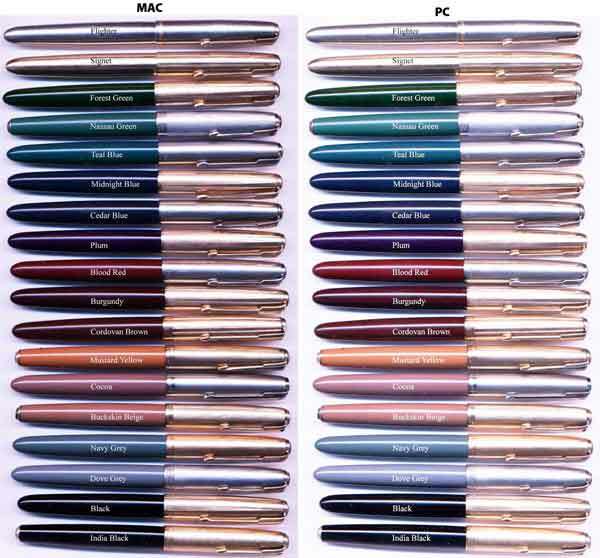 Parker spent the same amount in dollars to promote the pen, but in 1969 reached 400 million dollars in sales. A pretty good investment, eh? It was named the Parker "51" because Parker felt that they needed a name that wouldn't be hard to pronounce in any country and also easy to remember. Also at this time Route 51 was built through Janesville and it is quite probable that this also was a reason for the the name. Furthermore It also came out of research in 1939, the 51'st anniversary for the Parker Pen Company. The Parker "51" Mark II is probably the most functional fountain pen ever made. It never leaks, always works and never breaks, well almost... It also, in my humble opinion, is one of the nicest pen designs ever made. It was the first pen that had the nib under a hood, the thought behind this was not to let the ink have a chance of drying on the way from the ink reservoir to the paper. ll pens dry up if they are left unused and uncapped for a while. The hooded nib prolonged this unavoidable thing. To achieve this Parker also had to redesign the nib, a pen part that had looked roughly the same for centuries. 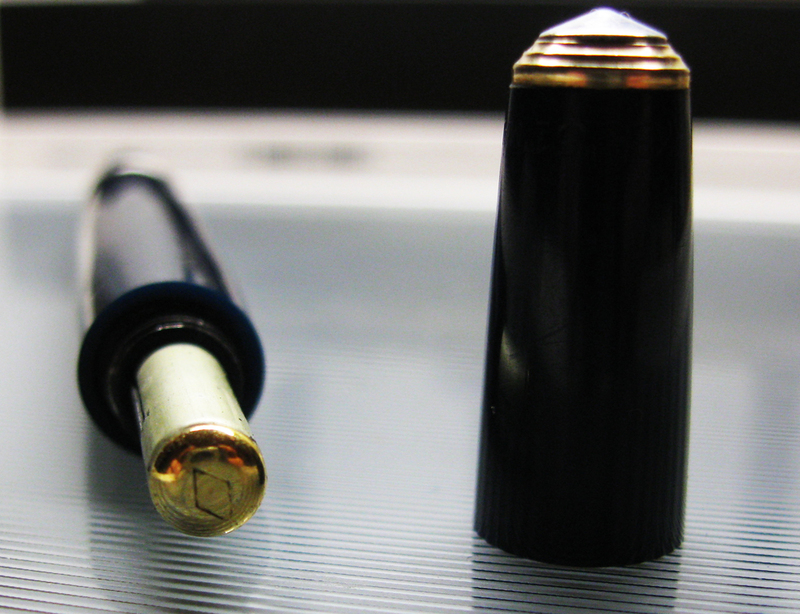 The new gold nib that was to fit inside the hood was tubular and rather rigid. The body was designed to look like a jet-fighter from the side (without the wings, of course) and the material used (Lucite) was the same that some wartime planes had in their nose-cones. There are two easy ways to date the early Parker "51" . First, starting in 1943, the year of making was printed at the bottom of the tubular nib, but of course dating from the nib is inexact at best, as the nib is one of the most frequently replaced parts. Secondly an imprint can be found on the top of the barrel, just under the cap clutch ring: PARKER "51" 6 MADE IN U.S.A. The small digit denotes the year of making for the barrel. This digit was deleted on the US made pens in 1953 but continued until 1959 on European (and Canadian?) pens, the same for the date on the nib. A "First Year" Parker "51" in Cedar Blue. from the first quarter of 1941. Note the distict features, Double aluminium jewels, metal filler with diamond imprint. he exception were the so called "First Year" pens, "MK 0", if You will, very sought for by collectors, that were produced during late 1940 and 1941. These pens had some distinct features. Most, but not all, had an aluminium filler with a diamond shaped imprint on the brass button, others came with the plastic filler. They also had a blind cap with a tassie ring, a feature that later on was fitted to the more high end Parker "51" models � so called "Double Jeweled" or simply "DJ" pens. Also the one-lined date code was situated at the end of the blind cap. This imprint was moved up towards the body clutch ring at the end of 1941, from 1942 the imprint was in double lines. The easiest way to quickly spot a First Year pen is that most of them were fitted with aluminium (aluminum) cap and/or tassie jewels. There are however today reproduction jewels available in aluminium, so this feature alone is not a guarantee that the pen is a First Year. Furthermore these pens were fitted with clips that had a larger blue diamond than subsequent pens and if the clip is removed the Parker imprint is visible in reverse on the back, on accont of a different manufacturing method. he blue diamond is also a shade lighter in colour. Inside the cap the clutch is also longer. It's not uncommon for the First Year pens to differ in the colour shades from pens later produced. The Parker "51" came in 4 basic different styles. There's been some confusion, since David Shepherd chose in this book "Parker 51" not to count the Vacumatic filler as MK I, instead starting with the first aerometric model. It might become grounds for confusion, but In this article the Vacumatic filler will be referred to as the MK I, the Aerometric with the rounded end as the MK II, the aerometric with the plastic jeweled "61" style cap and squarish end as the MK III and the aerometric with the metal jeweled "61" style cap as the MK IV. To complicate things further there's also a MK I-B, a transitional Vacumatic filler with the new style non-blue diamond cap with a long clip. The MK II can also be divided into MK II-A, with the longer clip cap, (identical to the MK I-B), the MK II-B with a shorter clip and MK II-C with an even shorter clip with fewer feathers and the "halo" logo on the cap. here's also the rare button filled Parker "51" referred to as the Red Band, which was produced for a few months only from June 1946 until the end of 1947, and the Cartridge Filler Parker "51", produced 1958 until 1962. These were however produced side by side with the standard line. Mark I (1942-48), had the (late) Vacumatic filling system with a plastic plunger hidden behind a blind cap. It also had the arrow clip with the blue diamond design previously added to the the Vacumatics in 1939. From 1943 the nib was date coded. here are also examples of Demonstrators, a pen in all aspects like the ordinary Parker "51" but made in clear plastic, showing the workings inside the pen, primarely made for pen sellers. Two versions were produced, the so called Half Demonstrator, which had the gripping section made in clear lucite was produced from 1941, some had the ink collector made in red, which created a striking effect. The Full Demonstrator, with both the section, body and blind cap in clear plastic, was made from 1945, although most are dated 1947-1948. Care should be taken when buying a Demonstrator, since there are a number of recently made replicas floating around. The replicas do not (so far) carry any date code imprints. Both the half demonstrator and full demonstrator are being reproduced, and also a version where both cap, barrel and section are made from clear lucite. All versions are being made both as vacumatic fillers and aerometric fillers with original Parker internal parts, so it's very hard to tell the difference. 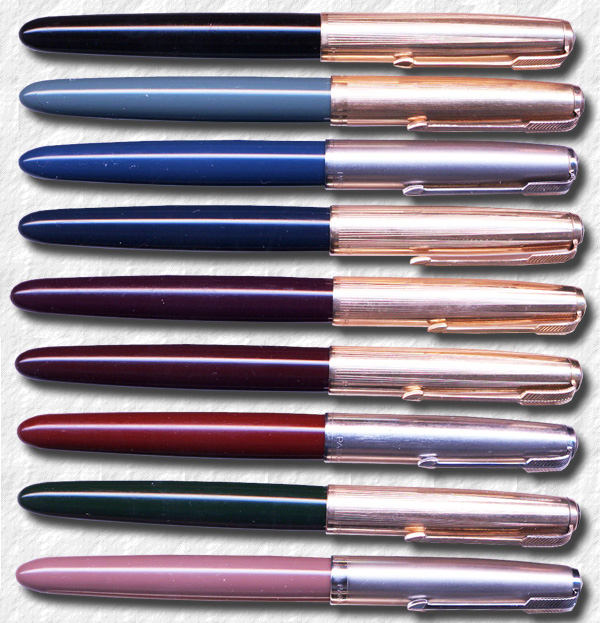 The Parker "51" aerometrics: Black, Navy Grey, Teal Blue, Midnight Blue, Plum, Burgundy, Blood Red, Forest Green and Cocoa. Sterling Silver with vertical lines with GF clip and chevron band, a cap band sporting a pattern of repeated chevrons, this is the most common silver cap. Heritage GF cap solid 14k gold clip, "squares"
Heirloom, all solid 14 k gold, fine barley Empire (aka Icicle, aka Manhattan, aka Empire State), all solid two tone red/yellow14 k gold (intro 1942) This cap was reanimated in 2002 when Parker launched the Parker "51" Special Edition. Some of these designs are very rare. arker had tried a number of new filling systems, ment to replace the Vacumatic filler and in 1946 an uncommon Parker "51" was introduced, the so called Red Band "51". It was in most aspects a re-designed button filler. It was fitted with red threads by the filler and it was also advertised as the Red band "51", as opposed to the Black band "51", which had the ordinary Vacumatic filler. The early red threads were made from plastic, while later versions had threads made from aluminium. Most surviving Red band pens are India Black, and a few has been found in Dove Grey and Cedar Blue. Red band desk pens are more common than pocket pens. The Red band Parker "51" was very hard to repair and it was discontinued already in 1947, making it much sought for by collectors. In late 1947 Parker in Newhaven, UK, started to produce Vacumatic filler Parker "51"'s, although no double jewelled pens were offered and the pens only came in the colours of India Black, Cedar Blue, Dove Grey and Cordovan Brown. But, like in the US, vacumatic fillers in Navy Grey has surfaced (there are also some examples of US-made Burgundy vacumatic filler Parker 51's.) These anomalies are most likely the result of pens having been sent back to Parker for repair, and since there were no more old stock, vacumatic filler sections and bodies were made from later aerometric coloured stock. These are relatively rare, especially the Burgundy. and the more uncommon Navy Grey. In 1947 a court ruled in the US that products could no longer be sold with a life-time guarantee. Parker decided to discontinue the Blue Diamond on the clips. The new clip was very similar to the early Vacumatic clips but was longer. The clip is often referred to as the "transitional clip and the pens could be categorised as the MK I-B. Both transitional and blue diamond clips clips offered until 1948, while Parker cleaned out old stock. These clips were also fitted to all vacumatic filler parker 51's made in the UK, no English blue diamond caps were produced. here are also two models of the MKII Parker "51": The first, MKII-A 1948-1949 had the transitional clip and the filler instruction engraving included "Press ribbed bar 6 times. There were two types of filler sleeves (see below) one was made of aluminium, the other of chrome-plated steel. Also the barrel threads were extended (raised). The second MKII-B model was made from 1950 and on, had a shorter clip and the filling instruction read: "Press ribbed bar 4 times", and the filler sleeve itself was made of brushed stainless steel. A rubber O-ring was fitted by the threads under the hood joint and the barrel threads were indented. There are no O-rings on the vacumatic fillers. The MKII pens of course had a brand new filling system that was to be adopted by virtually all Parkers in the future, the Aerometric. Almost all pens had to have moving parts (well, all until the Parker 61) to make the filling easy. Most European pens had screw or pump plungers (Mont Blanc, Pelikan etc) while the American pen companies preferred rubber sacs with different levers or plungers. These rubber sacs inevitably rotted away in time due to the acid in the ink. When this happened a lot of clothes got destroyed and the pen companies all had special departments that delt with paying for clothes ruined by their product. 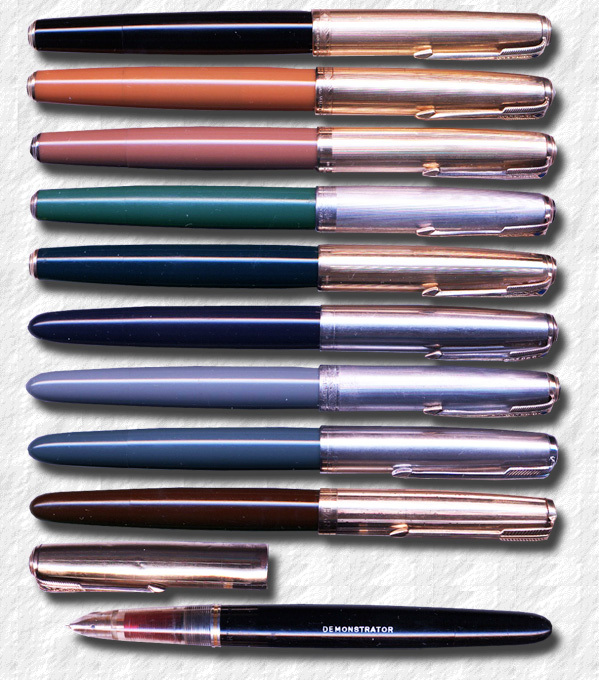 A collection of Parker "51" MKIII/IV in standard and uncommon colours. arker developed a sac in a tough plastic material, called Pli-Glass, that had a life expectancy of 30 years, but are now going on 60+. These sacs were also in a see through material which allowed one to see how much ink that was left in the pen. The sac was encapsuled inside a metal tube on which a metal pressure bar was mounted. To reveal this filling mechanism one had to unscrew the entire body cover from the section ring and back. Demonstrator. Not produced in the Demi-size. he aerometric filler MKII Demi was launched in late 1948, It was identical to the MK II standard Parker "51" type 1, only with diminished diameters, a miniature "51", if You will. The MKII Demis had chrome-plated aluminium fillers identical to the larger verisions with the imprint "To fill press ribbed bar firmly 6 times. Use dry-writing Superchrome ink." Also in 1948 The Parker "51" Signet was introduced with an all GF cap and barrel with vertical lines. It changed name to Insignia in 1957 and both names are used by collector's. In 1949 the Parker "51" Presidential was introduced in solid gold. The Demi pens were not made in this style. From 1950 the single "year" digit on the body became 2 digits. "MADE IN U.S.A. 50"
Also in 1950 the Parker "51" Flighter was introduced. This pen was made of steel with GF trim and survided until 1960. 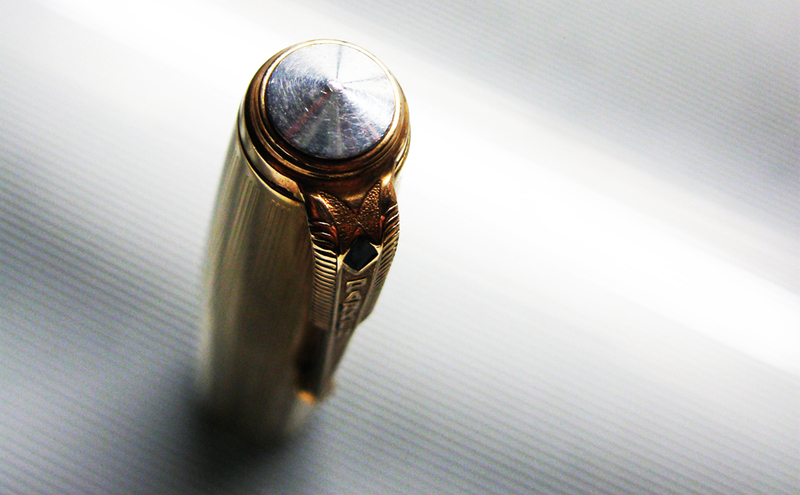 In the late 1950's the gold cap ring was deleted from the Flighter pen. A Signet/Insignia and a Flighter Parker "51". he MKIII Demi was also offered In 1950 when the model was redesigned with a metal casing, or sleeve, around the pli-glass sac that was shorter than on the larger model and the metal bar was curved like an "U" around the sac leaving it open (in a style later repeated on the Parker 21). The imprint on the filler now read "To fill press ribbed bar four times. Wipe front end. Pen point down, with soft tissue. Use dry writing Superchrome ink." Another Parker "51" was also added to the series in 1950, the Parker "51" Special. This had the aerometric filling system but in the manner of the Demi "51" with a U-shaped pressure bar. The big difference was that it sported an octanium (eight metal alloy) nib rather than one made of gold and it came with a shiny chrome cap only (the Standard Parker "51" were made in a matte chrome design). The cap jewel or clip screw, was made in black (while the Standard had a pearl coloured plastic)The "51" Special initially came in four colours, Green being a later fifth addition to the line. Black Grey Burgundy Blue Green. n 1954 the engraving Made In USA was added to the back of the cap. In 1956 the ink Superchrome engraving on the metal filler sleeve with filling instructions was replaced with Parker ink. In 1957 Introduced the Parker "51" Insignia but this was really only a renamed Signet. In 1958 Parker tried a the cartridge/converter filling system on some Parker "51's" but this didn't sell well at all so it was discontinued around 1960, making these pens rather hard to find. The filling system was instead moved to the Parker 45, introduced in 1960. Also in 1960 Parker stopped imprinting the the year of making on the nib and body on European made (and Canadian?) pens. The same year the additional logo with the arrow through a circle was added to the cap, aka the "halo" logo, while the Demi Parker "51" was discontinued. Images © 2012 and courtesy of Tsachi Mitsenmacher. n 1964 the imprint "51" was added to the cap lip. In 1969 the Mark III Parker "51" was introduced. 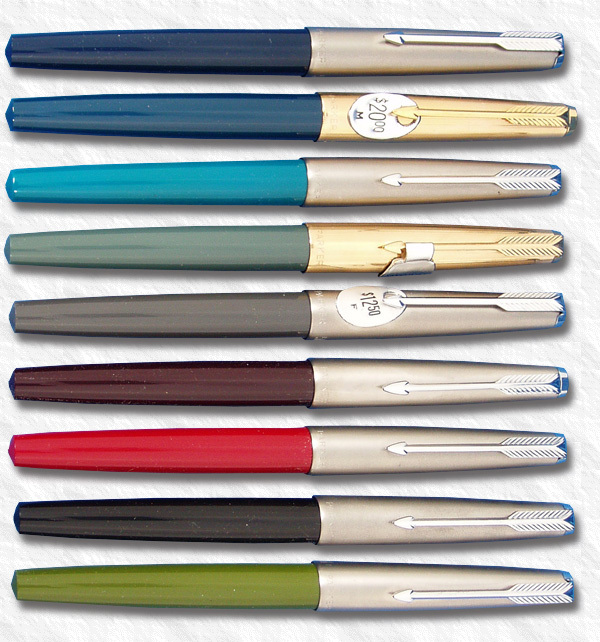 It sported a smaller, more conical cap, quite similar to the Parker 61, with the same type of clip. Also the section ring became thinner. The biggest difference between this and the Parker 61 was that the Parker "51" Mk III didn't have the arrow set in the plastic on top of the section just behind the nib. Mark IV (Early 1970's-mid 1970's) Still looked a lot like the Parker 61. Cap screw now in metal, section ring wider again. he Parker "51" became so popular that all the other American pen companies were forced to adopt the hidden nibs. The Parker "51" became such a status symbol that the company used to get large orders for caps only. The customers wore the caps in their pockets with the clips visible to let believe that they actually were proud owners of that very popular but also very expensive fountain pen... It is to this day one of the most collected fountain pens and one can still find them relatively cheap at theflea markets. The beauty and wide variety of colours and design, together with the unprecedented functionality has made it a real classic indeed. In 2002 Parker launched a retro model, the Parker "51" Special Edition in one of its rarest finishes, the Empire State Building etched cap. Read more about the great "51" in David and Mark Shepherds book "Parker 51"
the Empire State in solid two-tone gold. Perhaps rarer than the above caps are the "Fish Scale" caps in Solid gold. A fantastic collection of double-jewelled Vacumatic filler Parker "51" 's" with rare caps. From the top: India Black, Cordovan Brown (aka Burgundy), Dove Grey, Cedar Blue, Nassau Green (aka Sage), Mustard (aka Yellowstone) and Tan (aka Buckskin Beige). The three bottom ones being the rarest colours.